|In what is UNICAGE?, How UNICAGE? The Unicage system is composed of a data foundation system and an application system. 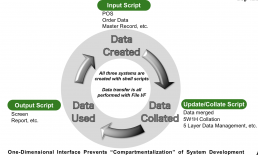 The data foundation system is a system that generates level 1 to level 3 data. The application system provides services along with data input and output for end users and other systems. 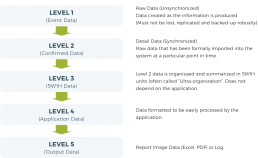 By using level 3 data (and where necessary the created level 4 data), level 1 and level 5 data are also created. Through research, education and promulgation of the “Unicage Development Method” and by advancing the development of a highly information-based society in the spirit of “Chisoku” learning the meaning of living through diverse life experience we strive to contribute to the realization of a generous “human society” rich in both mind and body.